Join the WT Enterprise Center Team! This position is for the WT Enterprise Center’s coworking program housed in downtown Amarillo on Polk St. with meetings and events also at the Western St. location. This position is responsible for managing the coworking space and implementation of programs and events for the Enterprise Center that supports entrepreneur growth and development in our region. This position is for the WT Enterprise Center’s coworking program housed in downtown Amarillo on Polk St. with meetings and events also at the Western St. location. This position is responsible for the managing the coworking space and implementation of programs and events for the Enterprise Center that supports entrepreneur growth and development in our region. Manage coworking facility, member onboarding process, and assist members as needed. Create and manage coworking events, training events, partner events and community events. Manage Enterprise Center programs with assistance from team members. Monthly reporting of program engagement and results. Coordinate with staff members to enhance entrepreneur engagement. Maintain systems to support communication, marketing and administrative processes. Professional development in program content, coworking management, and entrepreneurship. Bachelor Degree or equivalent combination of education and experience. Five years working knowledge of coworking and programs specific to entrepreneurial development. Excellent interpersonal communication skills; demonstrated competence in public speaking and group facilitation; excellent telephone skills; proficient computer skills with working knowledge of MS Office, Word, Excel, PowerPoint, Outlook, Internet and search engines, and database management systems. Proven drive and enthusiasm for serving people. Willingness to work some evenings, weekends, and special hours, as needed. Must have valid Texas driver license. 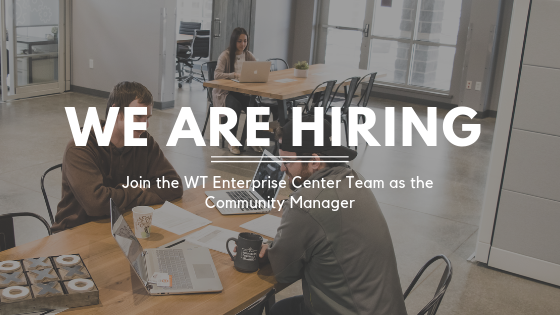 To apply for the Community Manager position at the WT Enterprise Center, click here!